It detects outside air temperature and converts it into a resistance value which is then input into the combination meter. Regarding wiring diagram information, refer to mwi-28, "wiring diagram". Disconnect combination meter connector and ambient sensor connector. Check continuity between combination meter harness connector and ambient sensor harness connector. Check continuity between combination meter harness connector and ground. 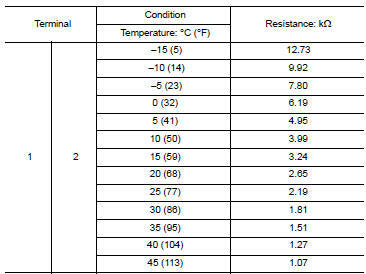 Check resistance between ambient sensor terminals. No >> replace ambient sensor. Refer to hac-106, "removal and installation".